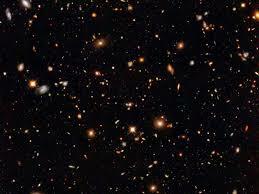 In 1995 scientists turned the Hubble space telescope towards a corner of space not thought to contain anything. A space that’s no bigger than an inch in our viewing if we hold our finger out at arm’s length. This was a big risk because of the enormous expense involved in using Hubble for something that might not even show them anything. Not only did it show them something, they witnessed, for the first time in human history, 10,000 previously unknown galaxies, each one containing hundreds of billions of stars. That’s right—every speck in the image is not a star but a complete galaxy. And likely every square inch of our view of space has an equal amount of galaxies in it. Have you ever sewed something that had a mistake in it, but it wouldn’t show so you didn’t worry about it? Note that God put all this in place billions of years before human eyes would ever see it. Earthlings saw it only 22 years ago. Why do you think he did that? I think perhaps one reason is that he wants us to know what he is capable of. This God of infinite power is the same one who helps us all the time, every day, with the tiniest and biggest of concerns. He is the one who remembers his promises to us. He is an omnipresent God—he is everywhere. He is an omnipotent God—he is all-powerful. He is an omniscient God—he knows all. The same God who breathed life into the universe and flung these billions of galaxies into their positions billions of years before we would ever set eyes on them 22 years ago, is the same God who cares about your littlest concern as well as your biggest problems. No, he does not want you to suffer with these things. He wants you to come to him. Actually I think you don’t have to go to him, he’s already there. He wants you to accept his power in your life. You can’t find that kind of power anywhere else. You might feel like you’re alone, or that nothing is happening to help you. But you are never, ever alone. And there are things constantly happening behind the scenes in your behalf. A powerful God who knows all has already started lining up solutions to problems you haven’t even had yet. What miracles have you experienced that by rights shouldn’t have happened? Psalm 139:1-3 O Lord, thou hast searched me, and known me. Thou knowest my downsitting and mine uprising, thou understandest my thought afar off. Thou compassest my path and my lying down, and art acquainted with all my ways.